Outfit by Carol Florence, modeled by daughter Rukiyi Florence. Ashley Vause with her colorful display. Bird's eye view of the 4th floor studio in Trenton Hall. Congrats to students, volunteer models and faculty! 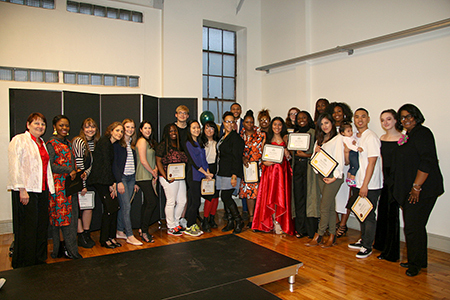 Trenton, N.J. – Style was front and center as Mercer County Community College (MCCC) Fashion/Apparel Design and Fashion Merchandising students presented an evening of fashion at their “Fashion, Arts and More” in May. 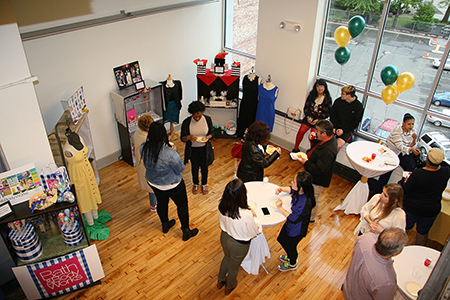 The community event was held in the top floor studio space at the James Kerney Campus’s (JKC) recently completed Trenton Hall. 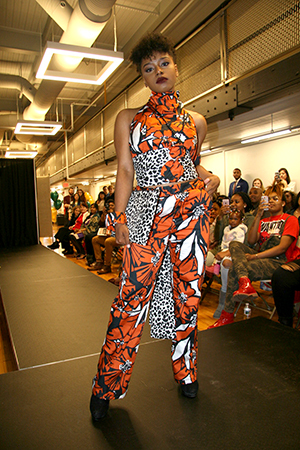 More than 100 people were part of the designer reception and fashion show that shined a spotlight on the depth of creativity and talent in this year’s program. The evening began with the viewing of window and store displays presented by students in the Fashion Merchandising program. 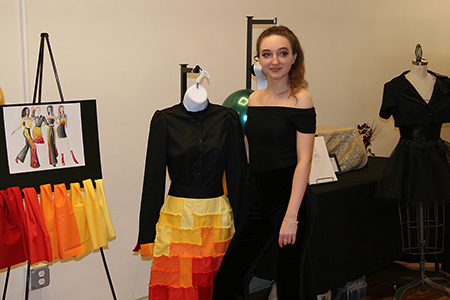 The student designers greeted guests and answered questions about their impeccably designed displays, created to reflect logos, color schemes and product lines for stores ranging from Bath and Body Works to Brooks Brothers and Urban Outfitters. The evening culminated with the program’s 2016-17 Fashion Show. MCCC designers, program alumni and volunteer models took to the catwalk, modeling creative couture. Fashion collections ranged from active wear and men’s metro, to evening gowns, crop dresses, and lingerie-inspired attire. The night drew to a close as students were awarded with certificates of excellence for their hard work and dedication.